A very very Merry Christmas to all!! It's that wonderful time of the year again, time for the baking, decorating and eating of Christmas Sugar Cookies ! Do you like my little girl's Santa Claus Cookie? We're going to save this cute one to put out for Santa Claus when he comes by on Christmas Eve. (Don't know how he's going to get into our tiny house!) These cookies are a great Xmas project to do with your kids cuz all kids love to draw and what better thing to draw on than a cookie you can eat! My little girl and I had a blast making these decorated cookies in preparation for the holiday season and we figured out some great tips for the cookie decorating part that made it much, much easier for my little girl to work with the icing to decorate the cookies. Our favorite Xmas tree ornament! Santa took a bite of our cookie! In the past I have always been astonished that people would want to steam rice in a pot instead of using a rice cooker. 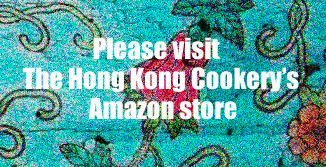 Why, I would wail, would anyone want to add more work into cooking a Chinese dinner! After all, if you wash your rice out well and are careful with the measurements, your rice cooker cooked pot of rice is a beautiful thing. However, recently we decided to try to Cook Steamed Rice on the Stove 完美的蒸米飯 and I realized at the moment I first tasted the perfect, perfect steamed white rice, that it was soooo worth that little bit of extra effort! A classic (and easy!) way to wrangle two delicious things to eat out of one pot! If you've never tried Chinese Lap Cheong, or Chinese sausage, you are in for a treat. These lovely dried sausages hung from hooks in pairs tied to colorful strings are so distinct in look, texture, taste and smell, just thinking of them reminds me of all the chinese groceries I have ever visited. A happy memory indeed! So this is one for all the sausage lovers as well as all the rice lovers in this world, not only will you end up with a delectable dish of steamed Lap Cheong but also a heavenly pot of rice aromatically infused with all the sausage's flavors! Steamed Lap Cheong Rice, or 蒸臘腸飯, is the perfect cold weather comfort two-in-one dish!